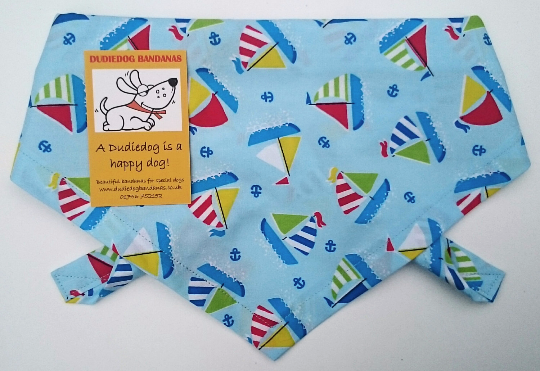 A gorgeous nautical style Seaside dog bandana in a lovely shade of pale, summery blue, decorated with little brightly coloured yachts and blue anchors. This is a really lovely design, and looks great on any dog! It's a perfect holiday dog accessory, and is great for the boys and the girls, for any occasion, particularly for holidays, sailing trips, and visits to the seaside. A perfect gift for your doggy friends!